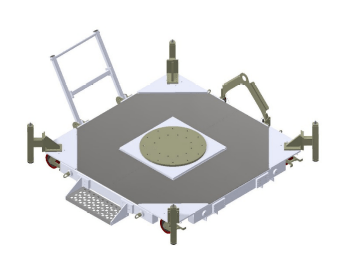 Flotron’s satellite mobile platforms are designed to support satellites in the vertical orientation, i.e. when the longitudinal axis of the satellite is perpendicular to the floor. The payload separation plane is low to the floor to minimize the required hook height when integrating the space vehicle with the platform interface using an overhead crane. The platform provides a working area for technicians to gain ergonomic access to the spacecraft during assembly, integration and test operations. Leveling jacks allow the technician to level the unit on uneven terrain. The satellite platform is designed to consider ergonomics during intra-facility transportation of the space vehicle. 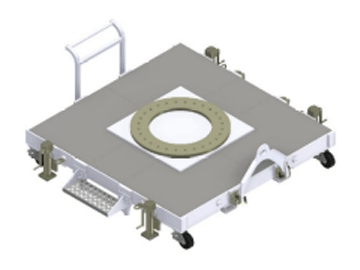 Caster wheel material has been specified to maximize rollability and both a push bar and a tow bar have been incorporated to provide options for maneuvering the loaded satellite mobile platform. See below for comparative data on the satellite mobile platform models and click on any image for additional information.